Pregnant moms going through your Robern Medicine cabinet for some relief for your all-day nausea, listen (or should I say, read? ): Shopping can sometimes perk you up and make you feel better more than Maalox can. Breastfeeding moms who feel limited by the notion of nursing in public, listen: there's a new maternity and nursing line for you! Moms looking for earth and family-friendly products, listen: a mommy market is ongoing at the mall as I type. 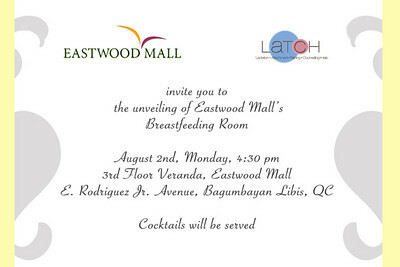 I'd like to personally invite you to a LATCH/Eastwood event this Sunday Aug 8 :-) This month is World Breastfeeding Month and my breastfeeding advocacy group LATCH has been working with Megaworld to help celebrate the occasion. We've been having activities this whole week, starting with the launch of the breastfeeding room and a photo exhibit. Right now, there is an ongoing mommy marketplace selling baby stuff and breastfeeding-friendly merchandise. The culminating event is on Sunday and we prepared a great line up of activities! Kindly see attached photos...they are evites to the various activities that will happen on Sunday. 4:30 pm A celebrity fashion show featuring Bianca Araneta-Elizalde's maternity/nursing line called Eden. The children will be dressed in Periwinkle and Baby Fashionista. Accessories by Tweetie de Leon. I hope you can help us in raising awareness about the breastfeeding culture we are trying to promote :-) Hope to see you there! Thanks again.